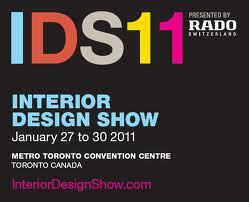 Today was Day #2 of the Interior Design Show (IDS11). Where yesterday was professional trade day, today was the first of two weekend sessions open to everyone - including the public. That said there was a different mix of traffic today, with more couples and families in attendance. Nevertheless the traffic flow through Studio North was intense yet again, and the following video clip will give an idea of some of the crowds. Incidentally, this video was taken during one of the quieter times - when it got really busy I was helping Kevin answer questions. In the grand scheme of things I'm glad we attended the opening night party, because that was the only time I got to see any of the non-Studio North exhibits.